Robert (Alexander) Schumann (1810-1856), was a German composer and music critic, and one of the leading musical lights of the early romantic era. He was the son of a bookseller/publisher and grew up engrossed in the romances of Sir Walter Scott, and ‘Jean Paul’, and the poetry of Byron and others. As a composer, much of his music was inspired by works of literature, the German countryside, and his own romantic proclivities. As a critic and writer on music, and an editor of a music magazine, he did much to introduce and further the careers of aspiring composers, notably Frederic Chopin and Johannes Brahms. 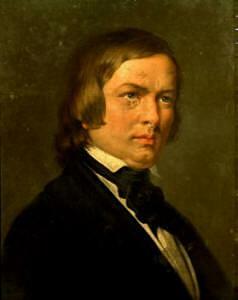 Young Schumann was sent to study law, but managed to study music on the quiet. He was a more than capable pianist, and in 1830, (the date of his first published work – the Abegg Variations for solo piano) with his family’s consent, he moved into the home of his piano teacher, Friedrich Vieck. Problems appeared with his hands; however he continued composing. He also started a relationship with Wieck’s daughter, Clara, a virtuoso pianist and capable composer. The family was against their union and it was not until 1840 that they were able to marry. Schumann that year began composing songs, many of which – like those in the cycles, “Frauenliebe und –lieben” and “Dichterliebe” – are ranked with those of Franz Schubert and Brahms. They are true partnerships of voice and piano. During the 1840s he wrote most of his symphonic works, chamber music, choral music, his only opera and more songs. He had started suffering bouts of depression which affected his creativity, however between times he wrote some of his finest works, particularly the Piano Concerto, and Piano Quintet – the latter, one of the finest in the repertoire. Piano Works – although he wrote 2 sonatas, it is his shorter pieces, or works consisting of miniatures that are popular today. “Scenes of Childhood”, “Papillons”, “Carnaval”, “Kreisleriana” are the most well known. Chamber Music. The Piano Quintet is the most well known, but he also wrote 3 string quartets, piano trios, violin sonatas, and other works for a variety of instruments: cello, viola, oboe, clarinet, horn. Drama – an opera (“Genoveva”, successful at the time but now not performed), and the "Manfred" incidental music. Vocal - Over 300 songs, plus numerous duets and partsongs. Choral – An oratorio: “Das Paradies und die Peri”, still performed, plus others. "Traumerei", from "Scenes of Childhood" is one of his most beautiful pieces. "The Grove Concise Dictionary of Music"
This page was last modified on 17 August 2016, at 16:30.